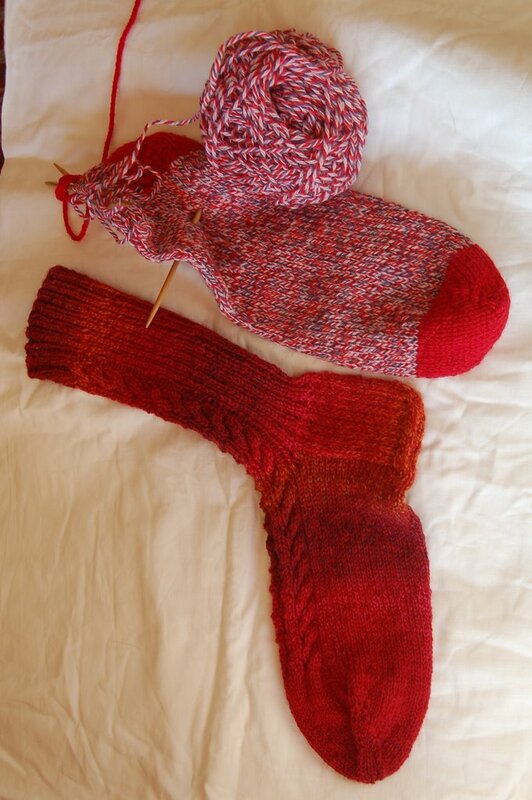 Well the socks are coming along slowly, I have finished one for my brother and the giant sock is well underway and might be finished tomorrow. 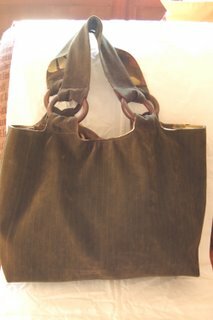 I sewed this bag at the weekend as a prototype, I am now going to try out, one a little smaller and one a little bigger to see how that works. Today a friend of a friend called me to see if I wanted some fabric that she no longer wanted. I was very near her house so went by to have a look. Unfortunately I had taken the bus into Grenoble so had no way of getting it home, I am going to pick it up tomorrow!! Tomorrow is the Grenoble Knitting Bee afternoon, this will be our second meeting and I am really looking forward to it. Just to be part of a group of women who are all different but who have something in common and to know that there will usually someone who can answer your questions and fix your mistakes is very cool. So I decided the Grenoble women needed to have a knitting group, so far we are pretty international and the styles of knitting are varied. This I love, I come from a family of “scottish” knitters, but I have to admit to using circulars more and more. So to study how other people knit I find fascinating. So far the Austrian, Hungarian, Australian and Danish section of the group knit continental but all with different ways of holding the wool, its great. The Irish, English and Scottish knit english, I have tried to knit continental but I think it is something I have to practice more as I found it much slower. We have one non-knitter in our group but that won’t last long she will be converted….soon! Hey, why does my spell check want to replace knitters with janitors?? Darn Blogger playing up – It’s me! I’m not annonymous! I want to come to a Grenoble Bee…. I’m sure you’d love to learn to spin. Thanks for the support re teenagers – I didn’t publish it because the young ‘un knows about my blog and I thought that this would be the one bloomin’ time he would read it! What a cute bag. I hope you show us the newly acquired fabric — sounds like fun. I’ve never had much of a fabric stash… but I could! when you say everyone knits english … do you mean that they are all drop yarn throwers, throwers or lever knitters? I’m always fascintated by how people knit too…and have noticed that most drop yarn throwers are North American. My sister taught me the right-hand-yarn method when she was a teen and I was about 6. (Who taught her to knit?????) A decade or so later she showed me the continental way, saying, “If my hands could learn to do this one complicated thing, it can learn another one”. I tried it after a while and I was okay with knit and bad with purl so I switched hands a lot until one day I was doing ribbing and finally refused to do it right-handed. Purling continental IS slower than knitting continental, but it beats RH. Then, another decade along, she told me she had been laddering-down a mistaken cable, and then knitting it up, back and forth, no turn-and-purl, so that she could keep track of the repaired cable. This I refused to do until last week when I started an entrelac project. I have to hold the bump-end (what is it’s name???) of the needle in a fold of my waist to hold it still because my left hand can’t hold and throw at the same time. So going to the left and going to the right are very different movements. That’s my story of left and right.